Laser cutters / etching machines will cut, etch and shape a range of materials with great precision. The process starts with the designer using a vector or bitmap drawing package such as Corel Draw or Corel Paint. A design is produced and saved in the normal way. When the drawing is ready to be etched or cut and shaped on a laser machine, the file menu is selected and from this the print menu and sent to the laser cutter in the same way as sent to a printer. The computer is normally connected to the laser cutter via a USB connector. 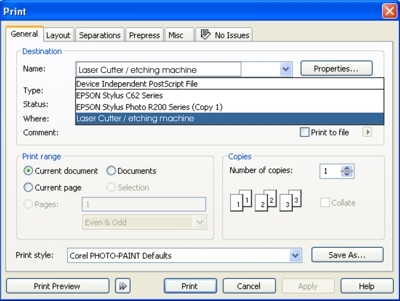 The file is transferred from the computer to the laser cutter. The laser cutter converts the design into coordinates and it is these that are used to move the laser lens system to the correct positions when cutting takes place.